Managing Director of Qualitrace, Kenneth Nelson, has revealed that plans are underway to set up an assembling plant for Amdrone Tech drones in Ghana. The move follows the use of drone technologies in Ghana, as a means of digitizing the agricultural sector. The Amdrone Tech drones are being used for farm spraying and in crop diagnostics. They carry out aerial spraying of pesticides, crop pest and plant nutrition management, agro-input services, among others. The drones come in 15 and 25 litres and have the capacity of spraying two hectares in 30 minutes and 100 acres in a day. 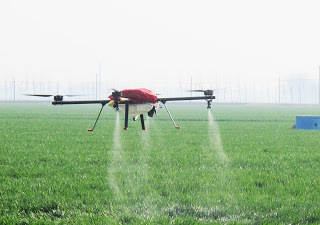 The application of the drones, according to Tobu Johnson, Head of Communications Technical Centre for Agricultural and Rural Cooperation, would led to an increase in income and productivity of farmers.